Made a lot of work with this wall. I got the scan from Dual-Anime (sorry Rexy for leeching!!! *runs and hides*) I remade the sky bg (from brushes and smudging here and there) and the transmutation circle. All the rubble I got from an assortment of sources which I recolored and repainted to have a really nice dramatic background look because I absolutely love the scan! 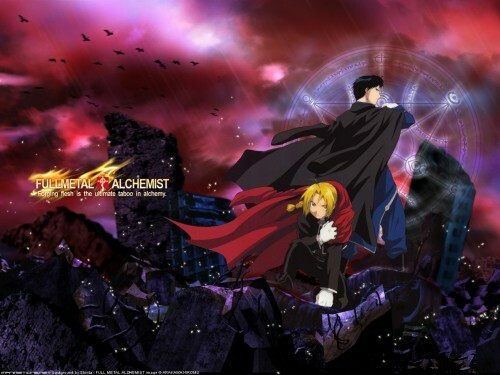 I'm dedicating this wallpaper to two friends of mine (Carlo and Anna) who constantly bug me to watch FMA which, until now I haven't done. ROFL. awesome Shinta!!! It's brilliant as usual!!! Wow, great wall you made here. I like how you made the ruins and BG as well as the transmutation circle. Also, looks great with Edward and Mustang in that pose, really cool. Anyways, great job on it and Keep up the good work! this ish sooo goood nd cooool!! i loovee THE buildings .. rawwrr!! demo ne... da building behind da text at da back, is blurry. which is weird. well for me that is ^.^"""
ah i love that torn down lanscape you made! its so surreal and post-apocalyptical. love the backgroud...espeically those buildings and the rubbles are really nicely done! Shinta strikes again!! No surprise. Great BG although I haven't seen much about the series but it looks cool! !